Governors are key players in the American federal system. In addition to administering complex bureaucratic organizations with vital responsibilities and multi-billion dollar budgets, they are expected to propose their own legislative programs, work closely with their state’s congressional delegation, communicate their goals to the public, and lead their state parties in elections. Moreover, in recent years the nation’s statehouses have frequently served as launching pads for presidential campaigns. Four of the last six presidents served as governors before moving on to the White House and several of the leading contenders for the 2012 Republican presidential nomination are current or former governors. Given the vital role of governors in American politics, it is somewhat surprising that political scientists have paid scant attention to gubernatorial elections. While there is a vast literature on congressional elections, only a handful of studies have focused on gubernatorial elections, perhaps because they appear to be so idiosyncratic—shaped by local candidates and issues. But appearances can be deceiving. I present evidence in this article that gubernatorial elections are strongly influenced by national political tides and that their outcomes can be predicted with a high degree of accuracy by the same factors that predict the outcomes of congressional elections. Since the end of World War II there have been dramatic changes in the frequency and timing of gubernatorial elections. During the late 1940s, 22 of the 48 states elected their governors every two years and about as many gubernatorial elections took place in presidential election years as in midterm election years. Over time, however, there has been a shift from two-year to four-year terms for governors with the large majority of gubernatorial elections taking place in midterm election years. Today only Vermont and New Hampshire continue to elect their governors every two years, 34 states elect them in midterm election years only, 11 states elect them in presidential election years only, and 5 states—Virginia, New Jersey, Mississippi, Louisiana, and Kentucky—elect them in odd-numbered years. As Larry Sabato documented in Goodbye to Good-Time Charlie, his pathbreaking 1978 book on the postwar transformation of the American governorship, the decision to hold gubernatorial and other statewide elections in midterm years was intended to insulate these contests from the potentially destabilizing effects of presidential coattails and other national political forces. However, the evidence in Figure 1 suggests that this effort has not been successful. This graph displays the change in the number of Republican governors in the 16 midterm elections between 1946 and 2006. The results show that despite the shift in the timing of gubernatorial elections, these contests have continued to be affected by national political tides. There have been dramatic swings in the outcomes of these elections with Republicans gaining as many as 10 statehouses and losing as many as 12 in a single year. Just as with seats in Congress, there is a strong tendency for the president’s party to lose governorships in midterm elections. Republicans gained governorships in 6 of 8 midterms under Democratic presidents and lost governorships in 7 of 8 midterms under Republican presidents. In general, the results of these gubernatorial elections corresponded fairly closely to the results of the U.S. House elections held at the same time—the correlation between the change in Republican governors and the change in Republican House seats is a strong .74, which is quite impressive considering the relatively small number of gubernatorial elections. 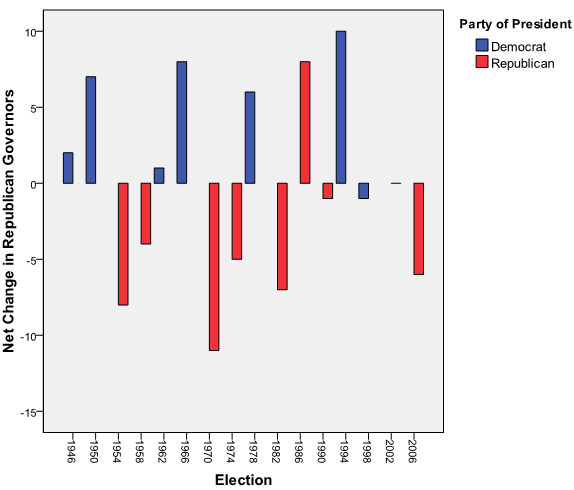 The results in Figure 1 suggest that gubernatorial elections are affected by the same national political forces that affect congressional elections. In order to test this hypothesis, I conducted a regression analysis of gubernatorial election results for the 16 midterms since the end of World War II. The dependent variable in this analysis is the change in the number of Republican governors in the election. The independent variables are the number of Republican seats up for election, to measure exposure to risk, the party of the president, coded as 1 for Republican presidents and -1 for Democratic presidents, and the Republican lead or deficit on the Gallup generic ballot question in early September, to measure the national political climate. The results of the regression analysis are displayed in Table 1. These results clearly support our hypothesis: the outcomes of gubernatorial elections are strongly influenced by national political forces. All three predictors have strong and statistically significant effects. The variable with the largest influence on seat swings in gubernatorial elections is exposure to risk: the number of seats Republicans hold going into the election. The more seats Republicans hold, the more seats they can expect to lose or the fewer seats they can expect to gain. In addition, the party of the president has a substantial effect. Republicans can expect to gain about 3 seats in midterms held under Democratic presidents and lose about 3 seats in midterms held under Republican presidents after controlling for the effects of the other predictors. Finally, the national political climate, as measured by the Republican lead or deficit on the Gallup generic ballot question, has a significant effect on the outcomes of gubernatorial elections. A 10 point swing in margin, such as going from a 5 point deficit to a 5 point lead, would be expected to produce a net shift of about 2 gubernatorial seats. We can use the results in Table 1 to forecast the outcome of the 2010 gubernatorial elections. The values of two of the three predictors in the model are already known: there is a Democratic president and Republicans currently hold 17 of the 37 governorships up for election this year. Only the result of the early September Gallup generic ballot question is not yet known. Therefore, Table 2 displays conditional forecasts of Republican seat gains depending on the generic ballot result. The data in Table 2 indicate that Republicans are likely to gain between 4 and 7 governorships in this year’s elections. Since they currently control 23 statehouses, this would leave them with between 27 and 30 governorships. 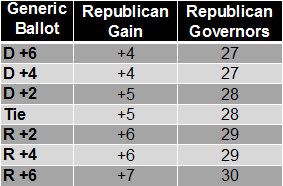 Since the Gallup generic ballot question has been averaging close to a tie over the past few months, the most likely outcome at this point would appear to be a Republican gain of 5 governorships which would give the GOP control of 28 of the nation’s 50 statehouses.